If your one of the many people finding themselves in need of a change of career due to unemployment or are stuck in a dead end job thinking of ways you could improve your life then there is something you should know with the current unemployment rate at the time of writing standing at 2.5 million in the UK competition for jobs is at its highest for a generation. Why are you telling me this you may ask? Well it’s like this; I am trying to impress upon you that to be able to get a good job in the future you are going to have to find a way to stand out from the crowd who are going to competing for the same jobs as you do. The solution: Training! Now more so than ever no matter what your career, get trained, get qualified. Why retrain as a carpenter? There are many reasons why it would be a good choice to retrain as a carpenter, for one there is a shortage of skilled carpenters (and other trades) in the UK so your expertise as a carpenter will be in high demand. And as an added bonus the high demand means being a carpenter can be financially very rewarding. Perhaps one of the most important reasons to retrain as a carpenter is that once you’re fully trained and qualified… YOU ARE A CARPENTER! And nobody can take that away from you. Being a skilled carpenter gives you options, you can work for yourself if you so wish, leave the rat race behind choose your own hours to suit you and your family’s needs, take holidays when you want, and no boss to answer to. Or perhaps you would just prefer to work a salary job Monday – Friday and leave your work behind every day when you finish, the choices are yours to make. How to retrain as a carpenter? Well there are a few options available which one that best suits your needs depends on your own personal circumstances’. First if you are under the age of 25 then maybe your best option will be to try to find a carpentry apprenticeship scheme, they can be hard to get on to due to the amount of people trying to get on them. Secondly and perhaps as a direct consequence of the difficulties of getting onto an apprenticeship scheme and the demand of people who want to get trained up for carpentry, there are now numerous purpose built training centres where you can study carpentry Full Time, Mon – Fri and learn what you would have learned throughout the course of an apprenticeship and as little as a few months! You may need/wish to take the course part time and spread it over a longer period of time most training centres will allow you to do this. The training you will get on these training courses is very thorough, and at the end of the training you would be up to the standard of a fully qualified carpenter, you will learn the theory needed for carpentry as well as extensive practical ‘hands on’ training in mock up buildings and rooms so you will be competent to put what you learn to use into any real life projects. Yes, these courses are not what you would call cheap! They can cost up to a few thousands of pounds, but you should consider this as an investment in your future, and these costs should surely pay for themselves as you start work as a carpenter. Another thing is to make sure whatever training course you start on is accredited by The City & Guilds, this is the industry standards body that sets out what are the necessary training requirements of the industry. 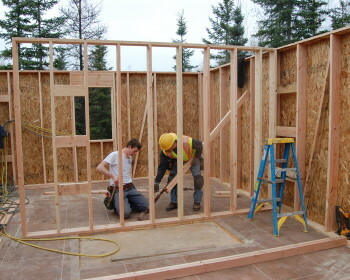 So you can be confident that you are being trained up to the required standards to be a fully qualified carpenter. Once you have finished a city and guilds course you’ll have various City & Guilds Certificates and all the technical & practical knowledge you need to start work as a carpenter.